South African artist William Kentridge (b.1955, Johannesburg) is renowned for his animated expressionist drawings and films exploring time, the history of colonialism and the aspirations and failures of revolutionary politics. In this major exhibition of six large-scale installations by the artist, music and drama are ruptured by revolution, exile and scientific advancement. The exhibition includes The Refusal of Time (2012), an immersive collaborative work featuring a shadow procession and a cacophony of clocks, bassoons and metronomes. The installation was created with composer Philip Miller, projection designer Catherine Meyburgh, choreographer Dada Masilo and scientist Peter Galison, alongside performers, machine-makers, costume designers and set designers from around the world. In Second-hand Reading (2013) we see the artist walking and ruminating while forests grow and stories falter against orderly lists of definitions. 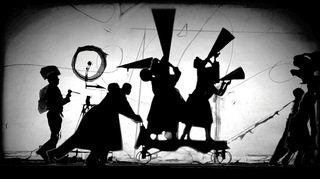 A selection of Kentridge’s books are displayed among mural-sized equestrian tapestries in a library, and a model theatre for the set design of Alban Berg’s 1935 opera Lulu is shown with projections of his powerful drawings. In Seven Fragments for Georges Méliès, Day for Night and Journey to the Moon (2003) the artist investigates the quixotic nature of creativity and the magic of film. Finally, an Istanbul hotel lobby sets the scene for O Sentimental Machine (2015) which explores the incendiary legacy of Soviet revolutionary Leon Trotsky and the artist’s exile in Istanbul. The exhibition is co-produced with Museum der Moderne Salzburg, Austria and Louisiana Museum of Modern Art, Denmark and tours to theWhitworth University of Manchester, England.